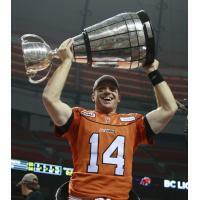 (Vancouver) The BC Lions Football Club today announced that quarterback Travis Lulay has retired from professional football. Lulay, a 10-year CFL veteran, spent his entire career with the Lions and sits third all-time among franchise quarterbacks with 21,252 passing yards on 1,658 completions with 127 touchdowns. The Oregon native added another 2,148 yards and 23 majors along the ground on 315 carries. A Montana State grad who went from a Portland free agent camp in 2009 to become the CFL's Most Outstanding Player and a Grey Cup MVP in 2011, Lulay departs the CFL after 146 regular season games, 81 as a starting quarterback and a win-loss record of 48-33. A two-time West Division all-star, Lulay also added a CFL all-star nod to his amazing 2011 campaign. Overcoming tremendous adversity numerous times during his tenure, he threw for 300+ yards 19 times and led the Lions to 13 game-winning fourth-quarter drives. A tireless contributor to the club's community programs, Lulay established himself as one of the club's most popular players in its 65-year history and thrilled a generation of fans with numerous clutch performances over the years. Remarkably consistent, he enjoyed a winning or .500 record against every other team in the CFL. Often performing his best in an always-tough West Division, he went 9-4 versus Saskatchewan, 9-5 versus Edmonton, 6-4 versus Winnipeg and 7-6 versus Calgary.